So what have we been up to this week? Not a whole lot, the weather has been terrible in Melbourne all rainy and cold. But we have managed to do something. Aaron and I have had some chats about old features that were needing to be added but since cutting certain ideas they have become less useful. We were going to add a ‘Distance Bar’ in the space between the stage and the block grid so that the player would know how much of the battle chain they had left. This made more sense beforehand but we have simplified the way we handled battles and so we thought it would be nicer to drop the bar, add in a monster count icon, and open up the stage space some more so we can fit in bigger and more menacing enemies like the Ogre. One of the other ideas was a character profile page to look at stats of your current puppets adventure, but since most of it was just for show we have decided to drop that and replace the puppet icon in the left corner with an icon to display your current level instead. Some of this week was spent cleaning the game up so it looks more polished and less like a dogs breakfast. We added in transition states between most of the game screens so things fade in and out nicely. I finally settled on a font for the game so we have now gone through and made sure all the text fits in buttons and is sized and positioned correctly. We have been adding more sound effects to the game. Most of what we had so far was Aaron making a noise in the mic to use as a placeholder. It served its purpose but now its time to get some real sounds, but I’d be lying to say I wouldn’t miss them. I’ve been looking at making some of our existing plays to have some more enemy variety. 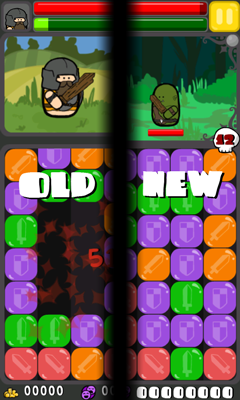 Adding some assassins and orcs to give the player some extra challenges when playing some of the different plays. One of the last things I did this week art wise was drawing the Colosseum. This will be a simple 4 act play with a boss fight in each one. When we add a new play we try to fill different gaps in play styles or gaming sessions the player would want. We have one play that is a long 3 act play for people wanting to commit to a big adventure, the Colosseum play will fill the gap where you can play the same boss over and over to improve your score because the play session is only about a minute. The game is coming together nicely, I think next week Aaron’s big focus is on the persistent score progression and mine will be on more content for the plays and polishing some of the stuff already there. Have a nice weekend, and we will see you here again next Friday.